In our little tea shop close to the Swedish mountains, customers would come and ask for tea bags. Sure, we said, here we have some to fill with your favorite loose leaf tea. Nah, they would go trekking, and filling teabags wouldn’t cut it, even with the finest loose leaf tea. Just too complicated. Tea for adventure – ready to go. The best tea we could find, and yes, it is all organic. So you can enjoy the great taste without worries about pesticides. 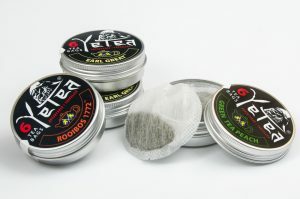 Tight packing, sure to keep your tea dry and fresh for optimal taste. If you travel or go trekking, it is ready to go, no need for another container. No envelope, label, strings or staples, just tea and a biodegradable tea bag. You do not need to separate the trash; it is all compostable. The lid is grip-friendly, so you can open it with cold fingers, or even while wearing mittens. Or one might say, as simple as it gets. 6 teabags in each tin. 3 different tastes (Black – Earl Great™, Green Tea Peach and Rooibos 1772™). Each bag contains about 2 grams tea. We are organic certified since 2009.